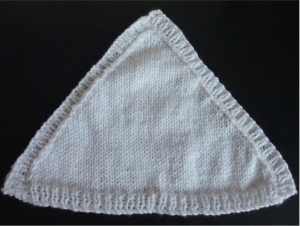 These are small knitted triangles that the mother rubs on her body and this triangle is then placed with the premature baby. This gives the baby the scent of the mother. Using number 10 needles and 4 ply wool cast on 51 stitches and rib (K1, P1) for four rows. Continue in stocking stitch (Knit one row, Purl one row) decreasing one stitch at each end of every knit row until you get 3 stitches. Purl these three stitches together. Using the one stitch on the pin, pick up another 50 stitches along the side, rib three rows and cast off. Pick up 51 stitches along the other side, rib three rows and cast off.